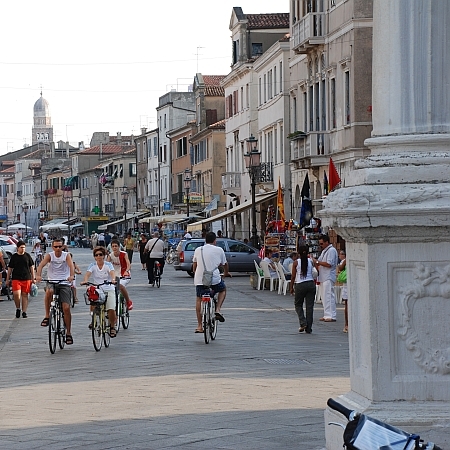 is located in Mestre(2 nights), Sottomarina/Chioggia, Rovigo, Vicenza, Bassano del Grappa and Treviso. Selected properties include three 4 star hotels, two 3 star hotels and one night in either a 3 or 4 star hotel. We are pleased to discuss details on request. 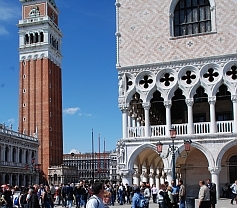 Mix canals, vaporetti and beaches, soft hills and green riversides with the stunning architecture of Venice and Vicenza, and the captivating castles of Asolo and Marostica. Add the heady delights of Bassano del Grappa and delicious villages along the way to Prosecco country - this tour has all the ingredients to give you a great taste of this enchanting corner of Italy. The cycling is easy, mainly flat or gently undulating with a few steep, but short, climbs. 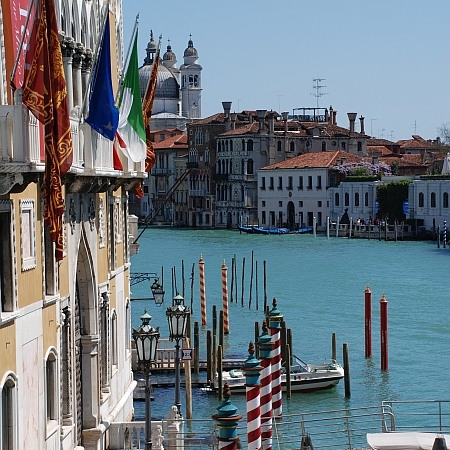 Check into your hotel in Mestre then hop onto a nearby bus for the 15 minute ride to Piazzalle Roma where you can hop onto a vaporetto and start to explore the extraordinarily unique city of Venice with a cruise down the Grand Canal. 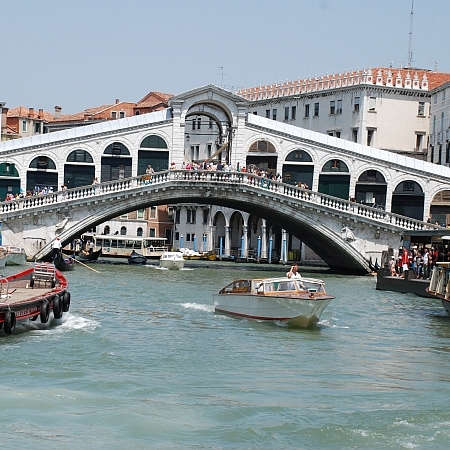 Start the day by riding across the Freedom Bridge to Venice, from where you take a ferry across to the famous Lido di Venezia. 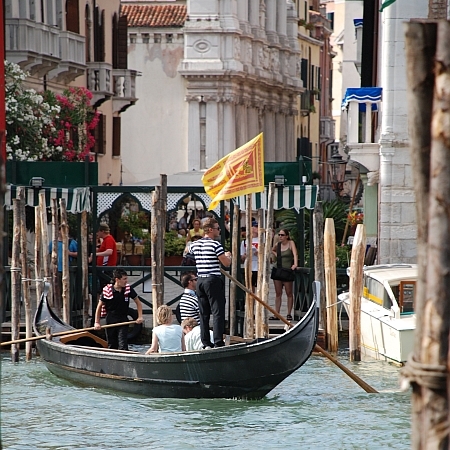 You may wish to interrupt your ride to the southern tip of the island with a halt to enjoy an ice cream and take in the view back across the lagoon to Venice or, perhaps, to go for a swim from the sandy beaches on the Adriatic shore. 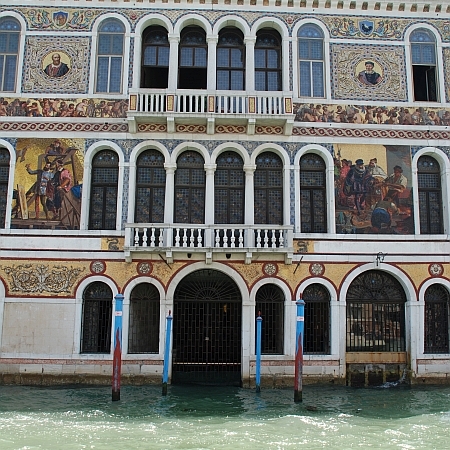 It's then time to hop onto another small ferry to take you across to the even narrower island of Pellestrina, which feels a million miles away from the hustle and bustle of nearby Venice. At the southern tip of Pellestrina, a Vaporetto takes you across the water to the heart of the interesting old fishing town of Chioggia, set on an island at the southern end of the lagoon. 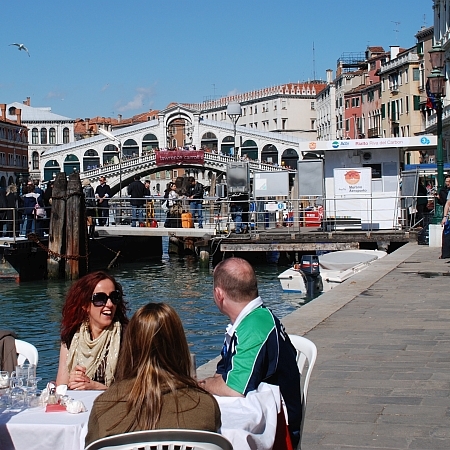 (Fares for two ferries & one vaporetto included). 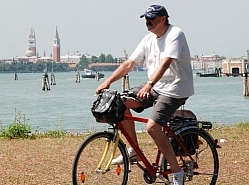 Cycling on quiet roads along canals and rivers, you pass through fertile fields, melon plantations and solitary villages on your way to your overnight stay in Rovigo . 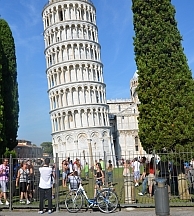 This is a charming and friendly little city of narrow alleyways, spacious piazzas and historic buildings. 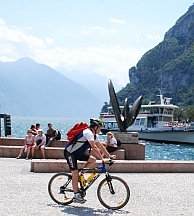 Today you let the train take the strain as you and your bike are transported to Monselice . 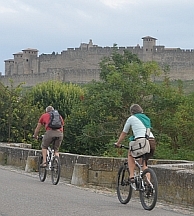 You then cycle through olive groves and the rolling Euganese hills, stopping at Arqu' Petrarca. This little town has maintained a medieval character over the centuries and took its name from the Italian scholar and poet Petrarch who is buried here. 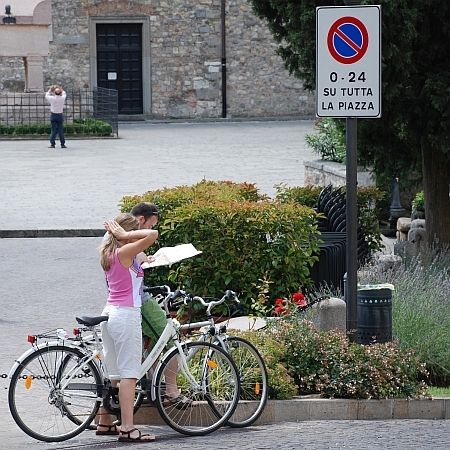 Continuing to follow little used roads, you skirt the edge of the beautiful Monti Berici which overlooks Vicenza . This historic city, with its many reminders of the 16th century architect Palladio, is where you will stay for your next night. (rail fare included). A day at rest in this lovely city, allowing you time to visit the striking Basilica Palladiana and the stunning Teatro Olimpico. You then pedal north to the walled city of Marostica, famed for its castle and giant stone chess board in the main square. Later you cross the River Brenta to Bassano del Grappa where you spend the night. Your day starts with a few small climbs that lead eventually to the narrow winding streets and frescoes of Asolo, a beautiful village which dates from Roman times. After a relaxing break, it's down hill through Prosecco country en route to your next hotel in the walled city of Treviso. Your final day's cycling takes you along the River Sile to Casale where it's onwards through relaxing country landscapes, pastures and fields to Mestre , returning to your first hotel. Depart after breakfast following a final night in Mestre. 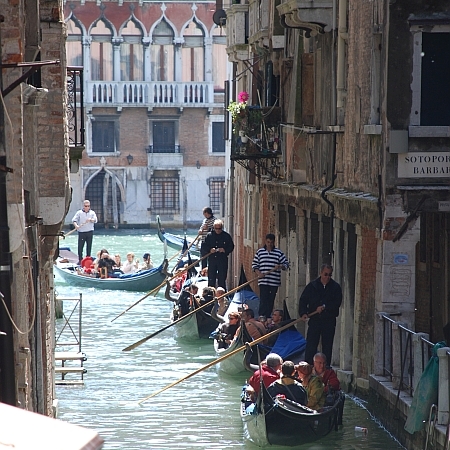 Extra nights can be booked in Mestre to allow more time to explore Venice. 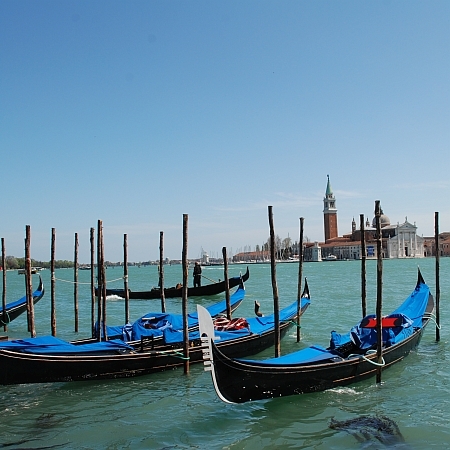 Alternatively, you can arrange your own accommodation in Venice if you prefer and simply drop off your bikes and pick up your luggage in Mestre.